Race Director, Axel Naglich, praised the condition of the slope and expressed his sympathy with regards to the training fall suffered by Max Franz. „We all wish Max a speedy recovery and hope that he will be fit again soon“. Technical Delegate, Daniel Menestrina, is pleased with the weather forecast during training: „The same conditions apply to everyone“. 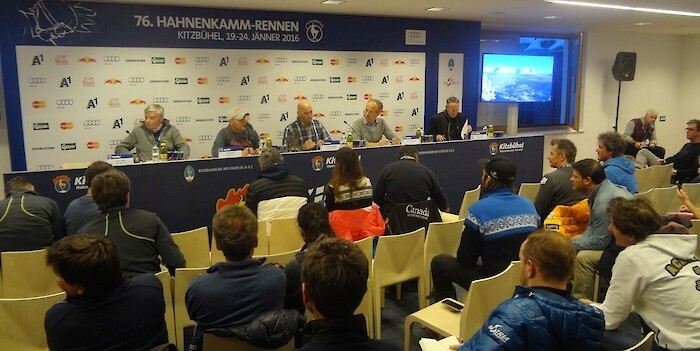 Light snowfall is forecast in Kitzbühel and fresh snowfall of up to 10 cm of is expected“. According to FIS Chief of Race Markus Waldner, the time interval between training runs should be increased to two minutes, in order for all top racers to complete the course without interruption: „Unfortunately, two racers had to be stopped with the yellow flag today. This should not happen in the next training session“. The Streif is closed for both racers and coaches tomorrow. The next Downhill training will be held on Thursday.